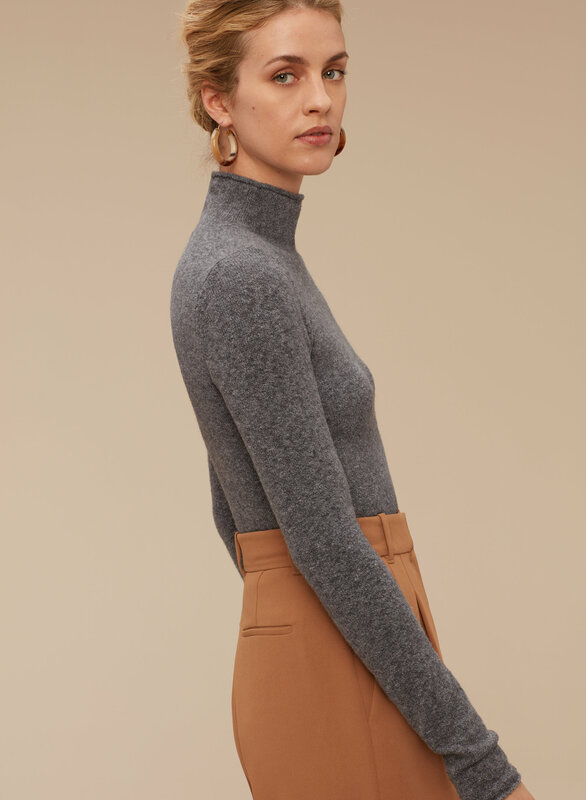 Knit with a gorgeously soft and textural bouclé yarn, the body-hugging silhouette of this sweater gives it endless layering potential. Warm form fitting sweater. Great colours. Nice cut. A little short and tight. I tried both the small and the medium in this sweater and opted for the bigger size as it does run a bit small. It also is a bit of a thinner fabric so can be sheer if it’s too tight - another reason I sized up. It’s super soft and the cropped length is great for high waisted pants or skirts. the texture is beautiful. I need more colours! Shorter than I expected, but comfortable material. 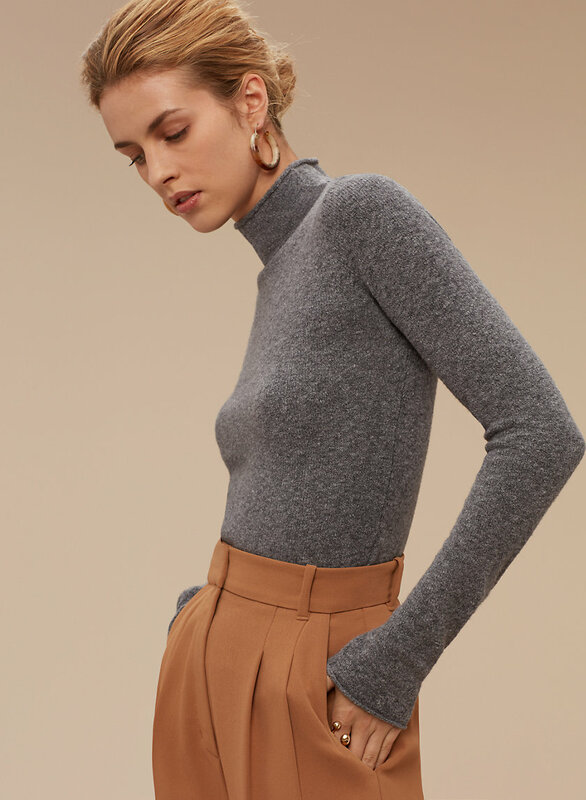 This sweater is a nice midseason turtleneck. I bought the oak colour, and it is slightly more sheer than I expected, but I think if I sized up, it would have been okay. I also found it quite short, it works under high waisted pants, but that is really it. I like the fabric, and the weight of the material. Have yet to wash it, so I am unsure of how it holds up while washing. Comfortable, and not itchy what so over. 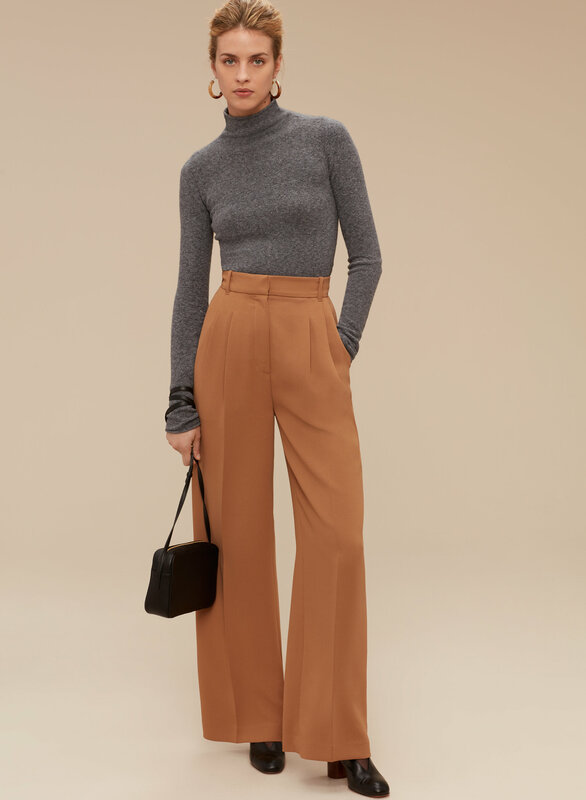 I would recommend it if you are a high waisted pant wearer, or want it slightly cropped. Love this top! Super soft and comfortable! I love this sweater because it's not too thick, but still keeps you warm! My only comment is that it runs a little short. Everything fit me perfectly aside from the length, and I don't have a long torso. The yellow colour shown on the site was very misleading. In person it resembled more of a puke yellow that looks pretty much unflattering on most people. Quality didn’t feel that good either. Other reviewers said it was very soft but I found that it was not the case. However the fit is flattering so I would suggest other colours. This is the first turtle neck sweater I’ve purchased. I usually dislike the feel but this one is soft and stretchy. Not at all itchy or uncomfortable. It’s a bit on the short side, but I normally only wear high waisted bottoms anyways. Looks cute paired with the Karmen skirt. It's very nice, I would definitely buy another one in a diffrent colour. It might be a little but loose as you wear it but overall still very good. I love the fit, close to the body and most of the colours; matches all pants and skirts. Length is to my waist so no tuck-in required. I have 4 of them... that's how much I love the style and fit! Versatile and forever in style. Colour is beautiful, just a little more snug then what I was expecting. Bought the red one. Usually wear a xs in sweaters and ordered a small since it looked pretty tight in the photos. And it was pretty tight! I would recommend to size up unless you like the tight look. Slim fit and not bulky. I like the soft fabric and rich choice of colours. I have a taupe colour top from last season and I recently purchased the cider gold. It combines nicely with wardrobe pieces. Fits true to size. Nice for the office. Very flattering fit overall! I appreciated the stretch as well as the softness of the wool, but sleeves were a little long. I also liked that the product was offered in a range of colours. I literally own this sweater in about 6 different colors. Nice and warm. I love how form fitting it is, as well as how it hits right at my belt buckle. I hate long sweaters. This isn't cropped on me, and it doesn't hit so low that I have to tuck it in.Just perfect. I am 4'9'' and 83 lbs, and I wear the xxs. Soft, light but keeps you cozy and warm. I loved this sweater when I first got it, but after wearing it twice it looked worn and old. 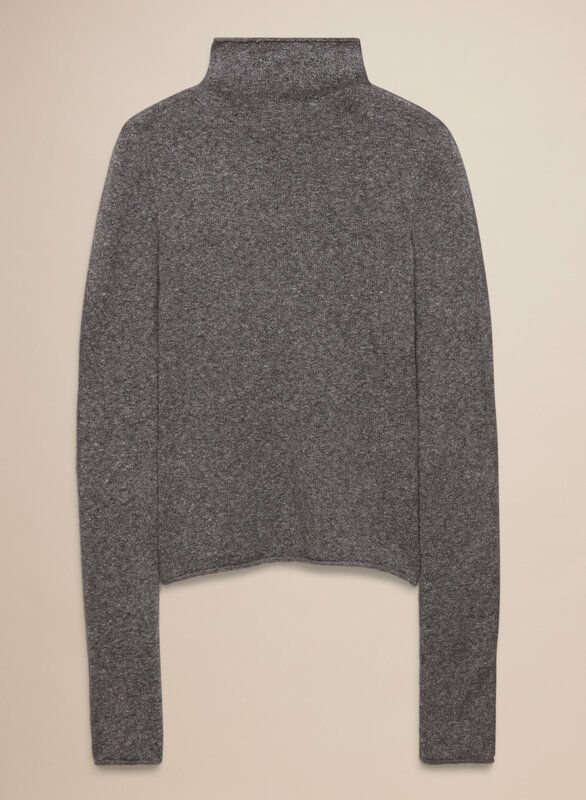 I am all for different textures, but please just ensure the quality is there because that is what aritzia is know for. I have three in different colours. I love how soft it is and the fit is snug and flattering.